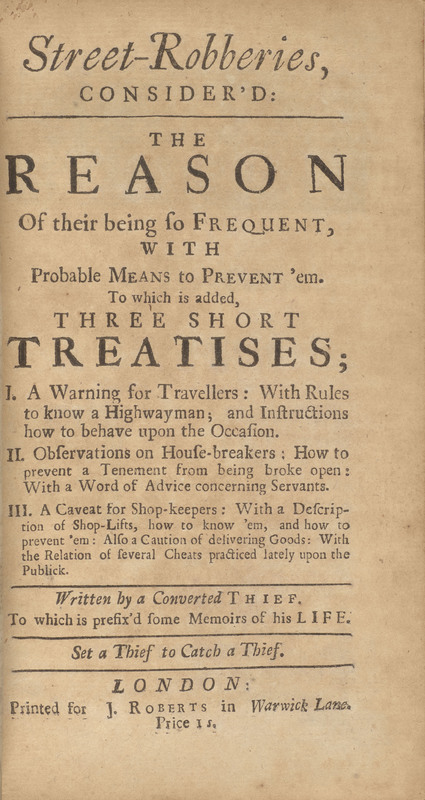 Like much of the work attributed to Defoe, the authorship of this short pamphlet is anonymous and questioned by scholars due to its tone and writing style. A work of fiction, the story is narrated by a supposed thief and filled with crude humor uncommon in Defoe’s other writings. Printed accounts of criminal activities were popular in 18th century England as a source of both entertainment and moral lessons. In many of his more explicitly fictional works, Defoe focuses less on clear moral distinctions and more on the motivations and reasoning behind individual criminal acts. Street-Robberies, Consider'd: The Reason of Their Being so Frequent, with Probable Means to Prevent 'em: To Which is Added, Three Short Treatises, I. A Warning for Travellers..., II. Observations on House-Breakers ... , III. A Caveat for Shop-Keepers...London: J. Roberts..., .